It’s a series of competitions organized and supervised by ProTour committee. In these competitions players can win standard prizes but what’s more important is reaching the finals. Players that reach finals* will directly compete for spots in Shadow Era’s World Championship 2018**. *Quantity of players for PT finals will be specified in the rules below. **Quantity of players that will qualify for WC2018 to be decided. 1- PT is now individual and not team based. In opposition to previous years, PT will be now an individual point board. This year your own effort will take you all the way to the finals instead of being carried by a team mate. There will be several tournaments labeled as PT during 2018 and each one of them will grant points for the PT point board. The better you do in this tournament, the more points you’ll get taking in count special rules that will be explained later on this same thread. How to sign up for these year’s PT? As simple as looking for any tournament with a PT label in the Shadow Era forum. You won’t need to do anything else (just an advice: try to use the same IGN every time or in case of changing it, update your IGN when you sign up for a new tournament). Each player will win 1 point per round won in a PT Tournament, understanding round for each opponent faced in a match (exceptions will be explained later on ). But this is just the standard pointing and there will be bonus points that we explain below. Round robin group format: The entire group stage will be counted as a whole which means 1 point for those that advance to next round. Then is 1 point for each round in playoffs won. In case of a entire RR tournament, each opponent defeated will grant you 1 point. Double elimination format: The Loser’s brackets or Second chance brackets will be counted as a normal playoffs format granting 1 point per round win. Final of Loser’s brackets won’t be considered as a real final and just as a simple semifinal. Tournament with uneven quantity of players: Tournament Organizers would always look for what its called “Tournament perfect numbers” this means having 8, 16, 32, 64, 128… players, these numbers give perfect pairings besides making easier to understand brackets. The thing is that you can’t deny participation to any player that wants to sign for a PT event so the chances of getting these “perfect tournament numbers” are low. In these cases any bracket generator online will add an extra first round to reach these perfect numbers. This extra round won’t grant a point for the winners. This is because the extra round is not for everyone and might be unfair for those not having to play it being one point below of those that where forced to play it. Pointing board and PT Finals. After each PT event finishes, points will be calculated and granted to the players that will add them to the General Pointing Board. At the end of October, leader* of point board will directly qualify to WC and the next Top X** players from the pointing board (starting from second place of leader board) will qualify for a final special tournament where the WC tickets will become the main prize***. *In case of a tie for first place of leader board, tiebreakers will be applied. **Number of qualified players to be announced. *** Extra prizes to be announced. In case of tied places in the general pointing board, points won in latest tournament will be an advantage. The closest the tournament won is to PT finals date, more chances to win the tie. This is due to assure active players reaching finals, there had been examples of players winning a tournament in march and qualifying for the finals in November with a big chance that this player has left the game in the middle. 10th to 25th will play the first weekend where only the top 8 will qualify to the second weekend. 2nd to 9th go directly to second weekend where the remaining WC spots will be given. How to host a PT Event. Anyone can host a PT Event and to apply you just need to reply to this thread showing your interest on hosting and explaining a bit the format of your tournament. A PT member of the committee will contact the interested organizer and give him the corrections (in case of needing them) or just a pm letting the player know his/her event is being considered. A voting will be held between the PT committee and only those tournaments approved by the member’s majority will be capable to add the PT label to his/her competition. Tournament organizers hosting tournaments with 32 or more players will receive 5 PACs (pick a card) courtesy of Shadow Era’s directors board. During the time the PT tournament goes on, a PT Committee member will supervise what happens with the organization and participation of players. At the end of the event, the tournament organizer must post a link in this thread or send it via pm to any PT member. No player can be banned for a PT event unless Shadow Era’s board asks for it by an official statement. There is no limit of players for a PT tournament and all players that signed up, will play. Special rules for formats and deck building: All tournament formats are initially accepted to later be discussed case by case by the committee before the approving voting. In case of deck building, no cards or decks can be banned with the exception of special rulings added by the host and approved by PT Committee. In any case, PT Committee will have the last deciding word. God’s Eye II: King of Stratagem. Thanks to SD Offspring for the great work. Last edited by paxvobiscum; 11-03-2018 at 10:20 PM. There might be slight adjustments but the main theme is the same. Looking forward for more participants. First two tournaments approved opened inscriptions guys. 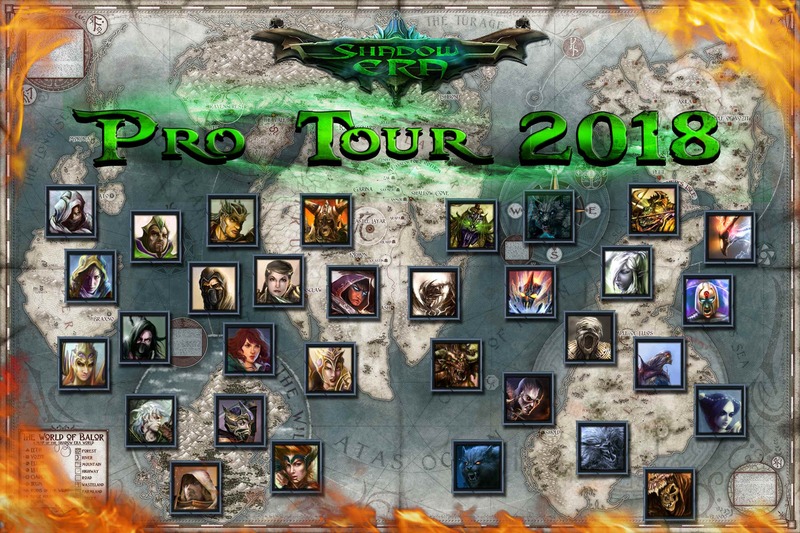 We hope to populate more than ever this pro tour. Removing teams should make things easier then before. A couple of downsides may be that you're still forced to play as many events as you can in order to score points, and that there are still so many details left to be announced. But all in all the format seems enjoyable, I may finally give it a try. For more details @etcVeles me on TG. Where can you see the current points/player btw?